If the World Series goes to a Game 5, the Dodgers, Kings, Clippers, Ducks, Rams and Galaxy will all be playing at home on Sunday. 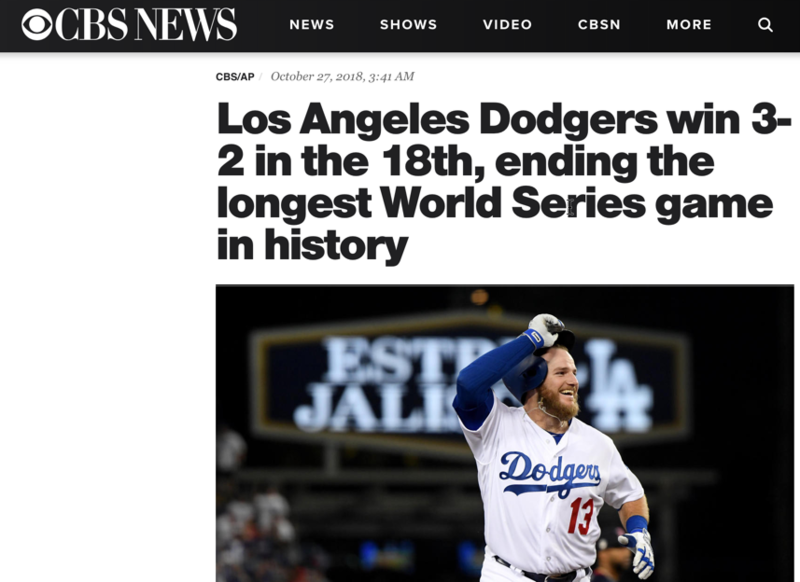 This Sunday there will be a Super Sports Equinox, and as 538 reported, as the Dodgers won game 3 in the World Series in a super long marathon game, Sunday will be a very special sports equinox in Los Angeles. So as LA might have only the 2nd super sports equinox in history, here is Pleasanton we will be watching a lot more sports than just LA teams. There is much more going on this Sunday in the world of sports. Formula 1 racing in Mexico City. Hamilton can become world champion, however, I personally will be cheering for Max Verstappen. Barcelona – Real Madrid |El Classico in La Liga. One of the most exciting games in the Spanish soccer league. What will you be watching this Sunday? I need multiple screens to stay up to date. Man I love my job! Here at Fanatics it’s fun to watch the stats of all players and think about new products. This year start in the MLB is showing a New York Yankees team fired up, delivering one of the best starts of the season in years. One player, in particular, is showing off his talent; Aaron Judge. The young player made his debut last year for the Yankees and hit his first career major league home run at his first bat! With Fanatics ability to create products in almost real time, you can get creative and appeal to the fans in completely different ways. 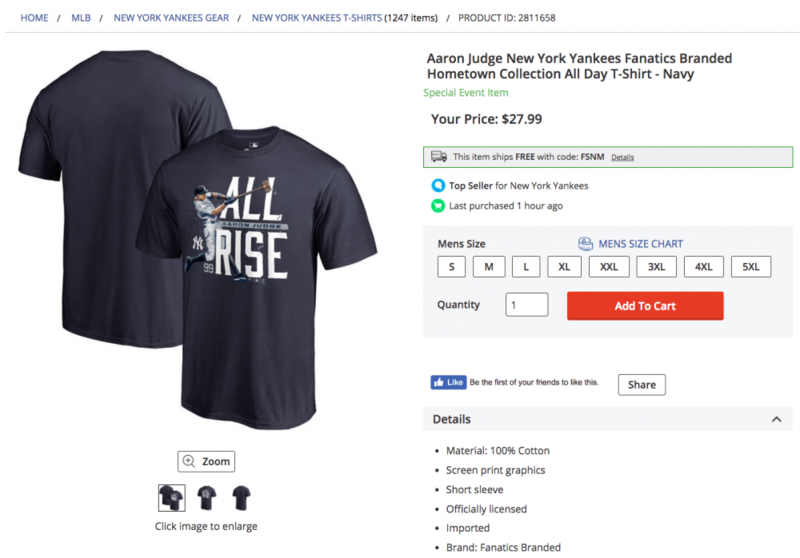 Case in point is the shirt here, All Rise for Aaron Judge. The Tshirt plays a fun punt to the tradition in every courtroom in the USA to call out to rise when the judge is entering the courtroom. Now available for all New York Yankee fans. 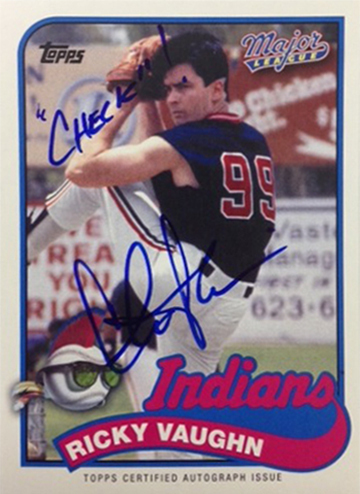 While I’m watching the World Series of Baseball for the last couple of nights between the Chicago Cubs & the Cleveland Indians, I can’t help my mind to wonder off to my teenage years when I had the movie Major League on VHS tape. I watched that movie so many times, that the characters from the film are like family to me. 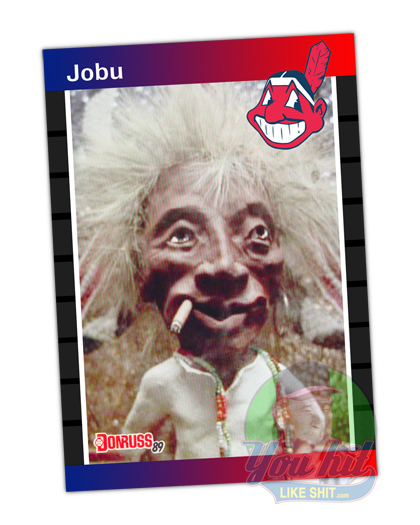 Ricky “Wild Thing” Vaughn, Cerrano with his Voodoo god Jobu, and Willie Mays Hayes (American Express, don’t steal a base without it!). They were my teenage baseball heroes. This time, I would like to see a win by the Chicago Cubs. 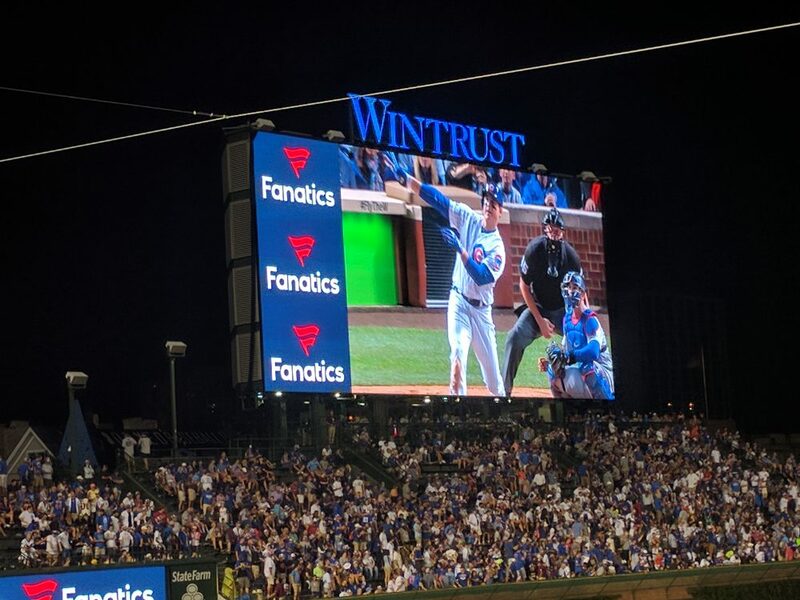 Over the course of the last year, while working with Fanatics, I’ve met some really passionate Cubs fans, and saw how Anthony Rizzo, one of their star players, is one of the nicest pro-athletes I’ve ever met. 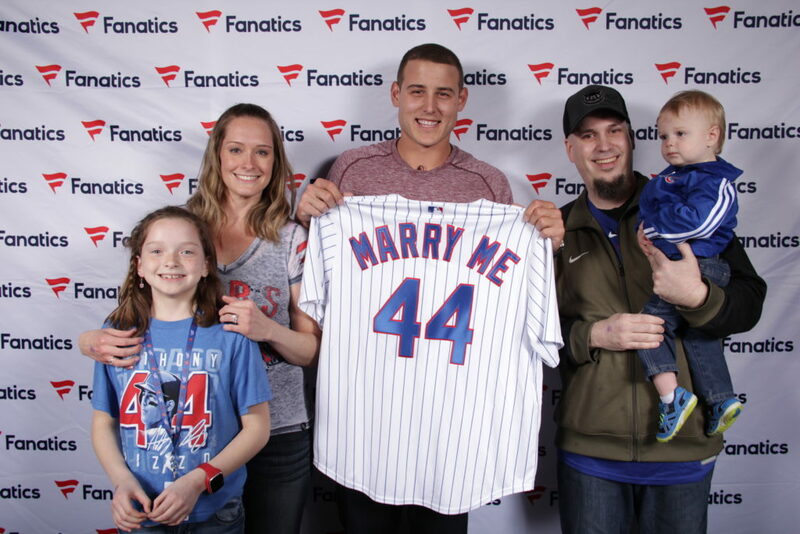 Just see how nice he is playing along in this surprise marriage proposal at the Fanatics Authentic show in Chicago. And what’s more, on one of our authentic shows, the main actor from Rookie of the Year, Thomas Ian Nicholas, paid a visit to our show. 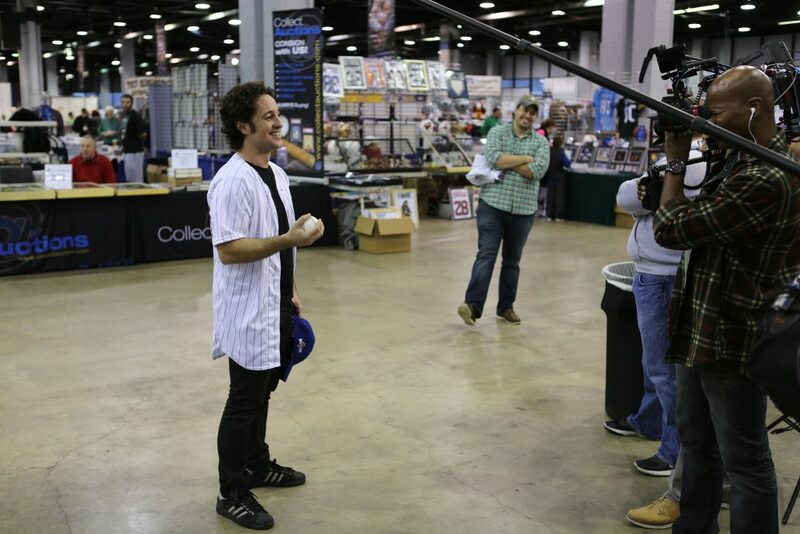 He did a couple of interviews while wearing his Cubs jersey. In the US, the Chicago Cubs has a very big fan base, and because they haven’t won the World Series for over 100 years, a lot of people have a soft spot for the team from Chicago. And then, of course, the prediction from Back to the Future the Cubs would win the World Series in 2015. Last reason why I would be cheering for the Cubs instead of the favorite team from my teenage years, I have a small obsession with Ernie Banks Google rankings. And Ernie Banks was a big Chicago Cubs player! 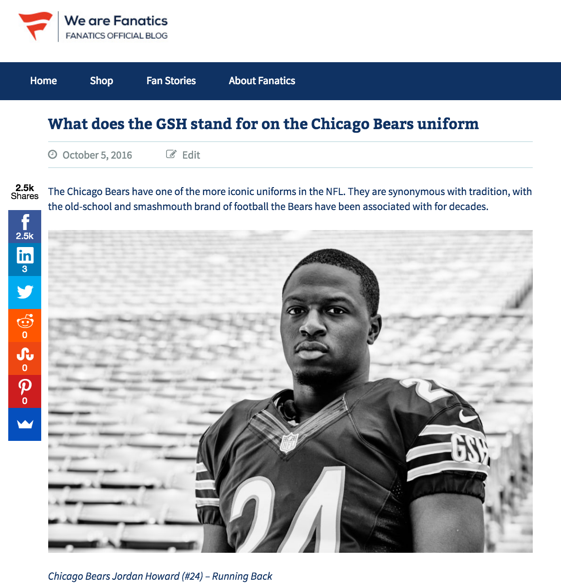 Is a question I found in the analytics for the Chicago Bears Jersey evolution post we published on the WeAreFanatics blog. As I didn’t grow up in the US, and started to love NFL football through airing of the games on Eurosport, I never learned what these 3 letter patch on the Bears uniform stand for. 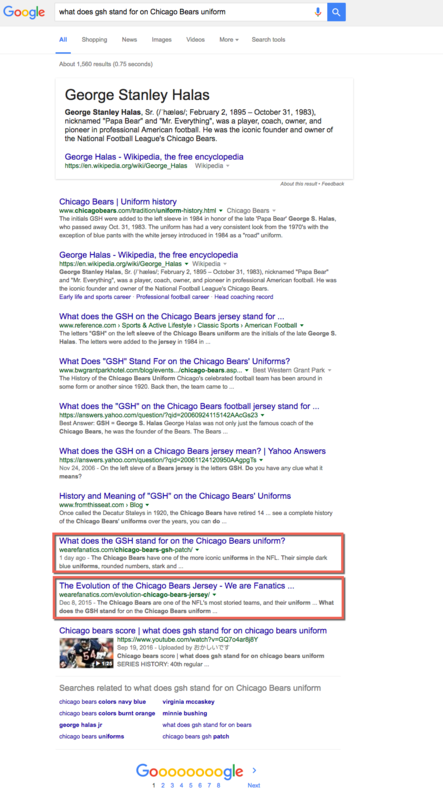 There is sufficient searches on queries (see screenshot below) like “Chicago Bears GSH Patch”, or “GSH on the Chicago Bears jersey”. I decided to have a blog post written on the topic. What does the GSH stand for on the Chicago Bears uniform? So, what does GSH stand for on the Chicago Bears’ uniform? Well, they’re the initials of George S. Halas. Who is this Halas guy, you ask? Well, Halas played for, coached, and eventually owned the Bears. He was involved with the team in one capacity or another from 1920 until his death on Halloween in 1983. In his different roles, he had a hand in six NFL championships. After his death in 1983, the Bears honored his historic legacy with the GSH initials on their left sleeve, where they remain to date. Generally, the evolution of the Bears’ uniform has mirrored the many variations of the team over the years, though certain elements have never vanished. Luckily, Fanatics has its own repository of high quality merchandise and player’s wearing the team’s gear pictures. So it is easy to include a picture of the Chicago Bears Jordan Howard wearing a Chicago Bears jersey with the GSH on his left sleeve. If you don’t know, your not a real Bears fan! Its stands for George Stanley Halas, founder, player,coach of the best NFL team, the Chicago Bears! Well, yeah, sure. 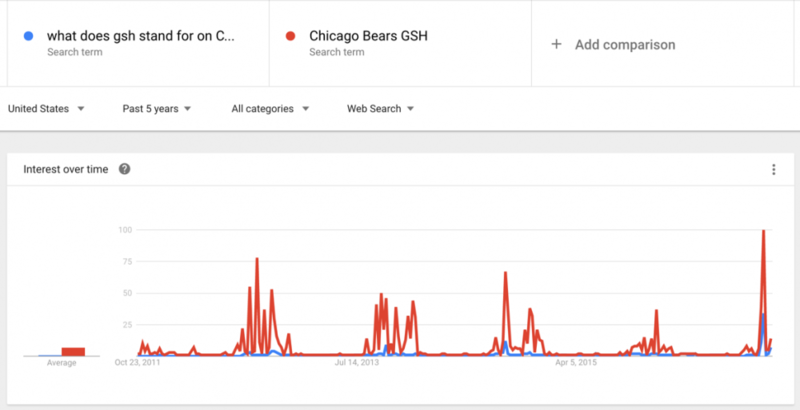 But apparently, there are many people asking themselves what the GSH patch on the Chicago Bears left sleeve stands for, just check out Google trends for the terms “What does GSH stand for on Chicago Bears uniform” and “Chicago Bears GSH” over the last 5 years. Consistently there are spikes in searches during the NFL season. 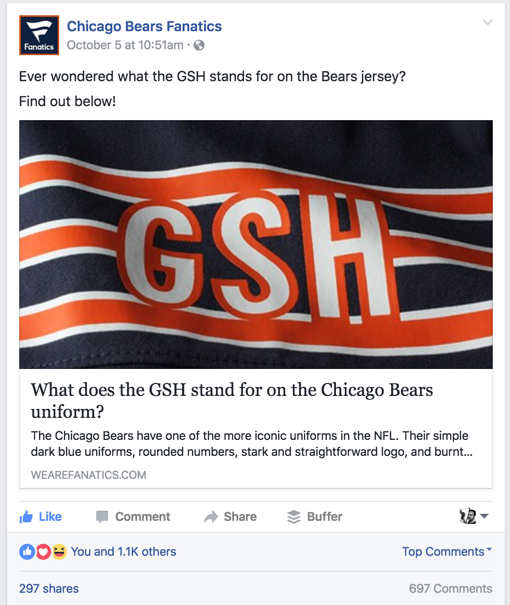 And with a quick blogpost, and a large social engagement on Facebook, we managed to rank the page quite easily for the query on the first page, just above the Chicago Bears jersey evolution post with which this whole story started. 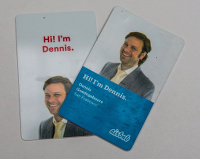 With the return of the family last week, the #SummerOfDennis has come to an end. And although I did make a to do list with projects to accomplish in the time they were in The Netherlands, only a small number of the items got done. But I don’t even feel bad about it, although I still would like to get these items scratched off my list. I was just busy with other stuff at Fanatics, which needed my full attention. Its been a busy couple of months at Fanatics. Since I joined the company already 1.5 years ago, a large number of projects have been rolling out, building the foundation for a big growth push. The acquisition of Kitbag back in February was exciting, not only because it allows Fanatics to enter the soccer market, or I should call it football as in Europe, but more so as it was a project I was able to play a role in myself. The month of July showed a number of moves Fanatics made, which shows how serious we take our growth. Over the course of the last 2 years, the team in the Bay Area has grown to ~200 people. These folks were split between the San Francisco office, and a space at the Plug & Play facilities in Sunnyvale. July 8th marked the date Fanatics opened up a new office for these two team in San Mateo. A huge space, with enough desks to grow the team in the Bay Area. With the redesign of the brand last year, the company is now ready to build more brand awareness. For months we have been looking at the video’s below, before we could release these into the market. And with the launch at the ESPY Awards, Fanatics is now actively in the market showing interesting fan video’s. 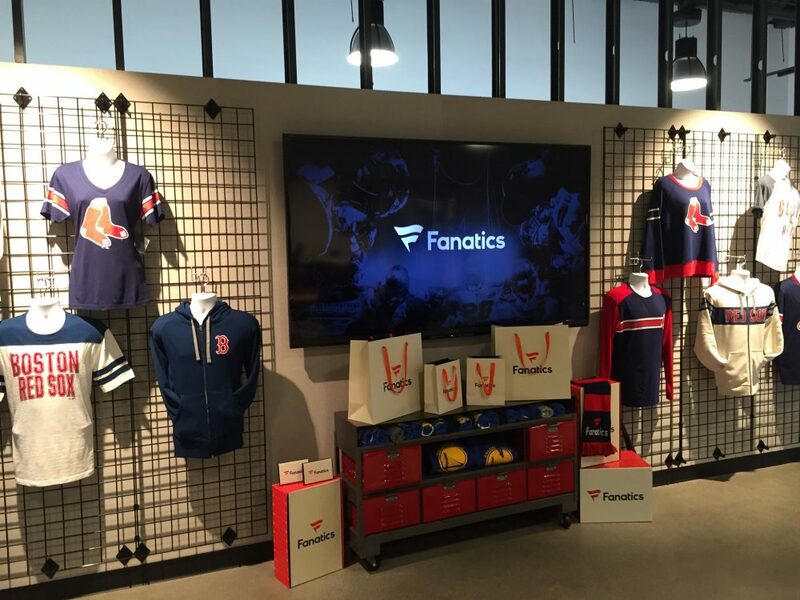 With the marketing campaign, Fanatics is trying to capture those fan moments which are unforgettable and showing what it means to be a sports fan. The slogan, Love Never Loses, tries to showcase that even when your team loses a game, you still win because you love your team/sport. The two below here are so far best received with people. Probably because of the cute kids in the video’s. As the post on the St. Louis Cardinals uniforms was published already back in May this year, a sudden traffic burst peaked my interest. The increased interest came from fans who were searching for the special uniforms the Cardinals were wearing last week. 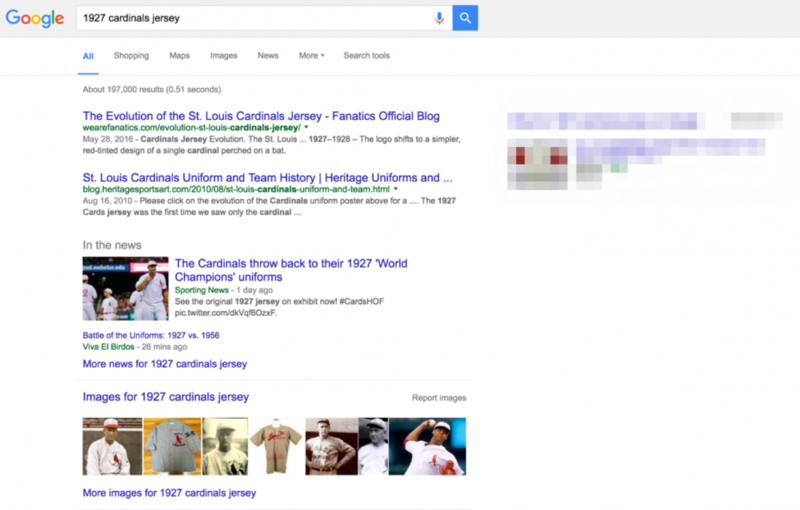 It showed a lot of organic search traffic on keywords around the throwback uniform the Cardinals were wearing during a weekend game. It was the uniform from their 1927 championship year. It helps off course that the post is ranking #1 on a number of relevant searches. 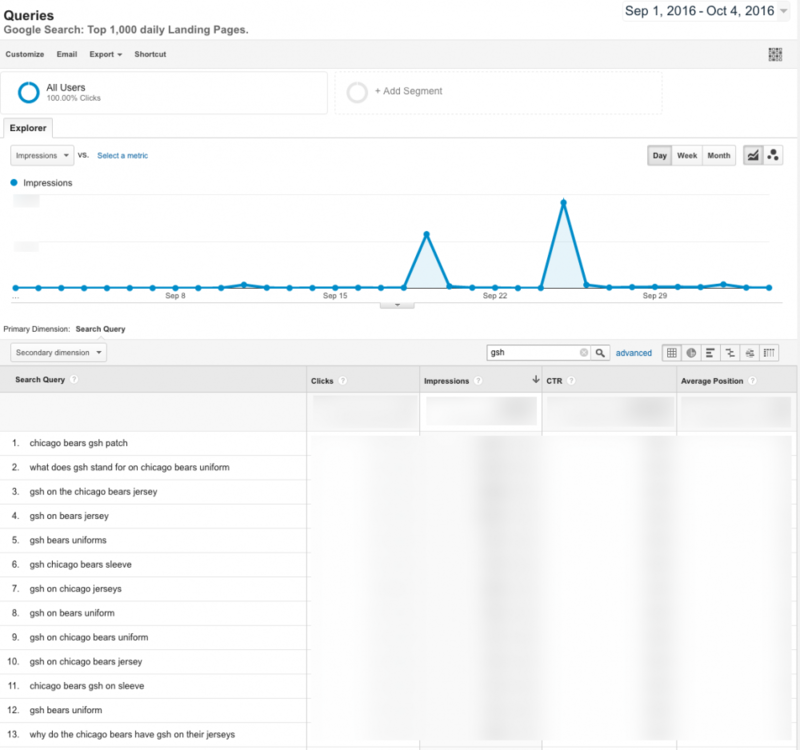 A nice little traffic bump, and showcase the need to create content which ranks well in search engines to drive more top of funnel traffic to build a business. I’m going to pull numbers on the sales in the St. Louis Cardinals Retro gear to see the impact it could have if we scale this further. As of February, Fanatics is also the official partner for Manchester United, Chelsea and Real Madrid, among other Premiere League teams. 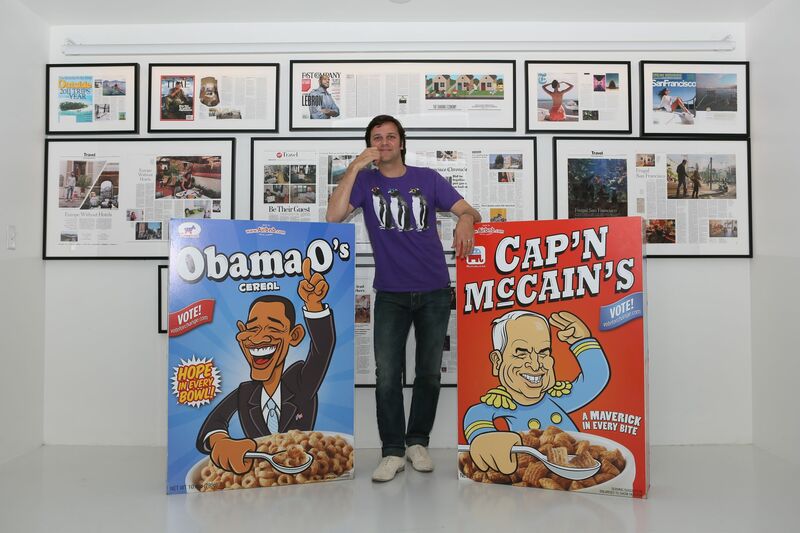 In August we finally launched the US versions of these soccer team shops targeted at the USA soccer fans. A number of SEO learnings I will be able to report in the future due to this launch, as the setup between the global sites and the US ones is rather complex. More goodness to come soon! Right after Game 6 in the NBA playoffs Western conference, where the Golden State Warriors tied the series with the Oklahoma City Thunder, Dubnation fans out-tweeted the fans of the Thunder 2:1! Here at Fanatics, I’m always searching for new ways to create the Presence Content layer in the Content-Brand Pyramid framework I’ve been working with for 2 years now. With a tool like the Fanatics NBA Playoffs Twitter tracker, stories almost write themselves. 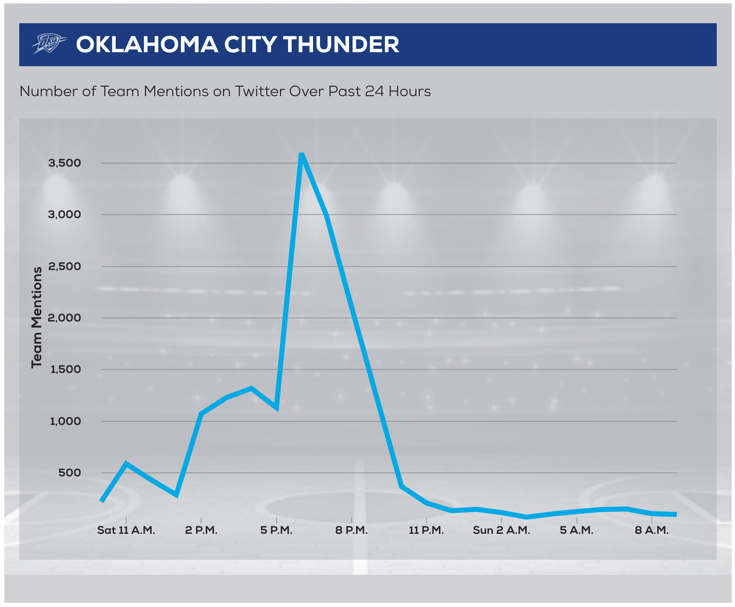 Two simple graphs show how Warriors fans were ecstatic after the win in game 6, while the Thunder fans must have switched off their TV, and immediately went to bed without sending any message into the Twitter-sphere. The purpose of the Twitter tracker is not only to be fun for fans, but also to build the Fanatics brand. 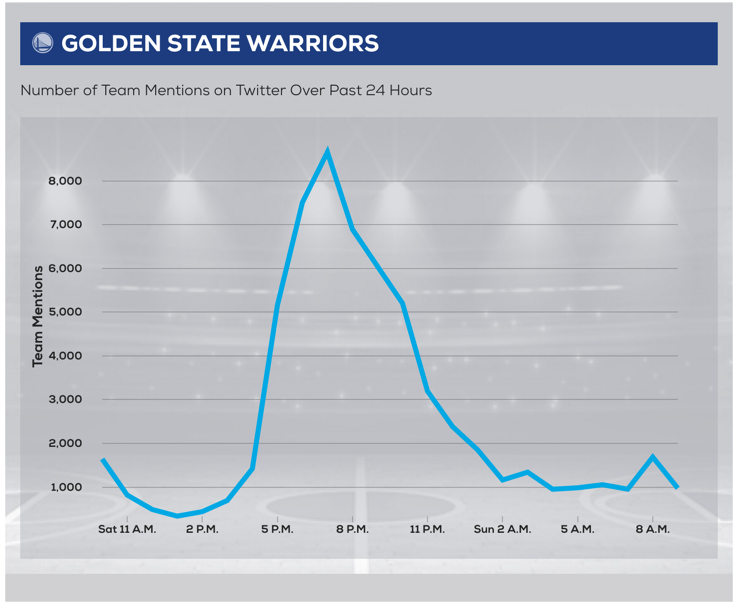 By getting the tracker covered in mainstream media, USA Today, more NBA fans can enjoy the daily updates on which team in the playoffs is most popular on Twitter. 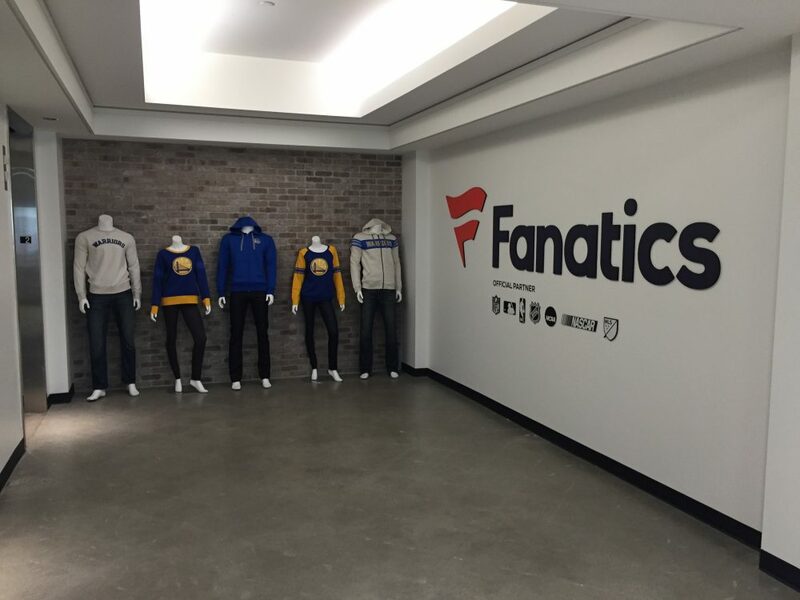 Next time these fans want to buy their NBA team jersey, Fanatics might pop-up as a great place to buy. Competing with Yourself, Do You Have What It Takes? Oh the irony. I’m competing with my own SEO strategies from years ago. When I was working at eBay, creating lasting strategies to bring mountains of free SEO traffic to the platform, across multiple categories, I could never imagine I would curse the success I’ve had as I would be competing with my own strategies. At Fanatics, I will make it my mission to de-crown eBay on a number of Pet-Peeve queries I’ve had some success at while I was at eBay. Sometimes, I took it to the extreme, and made it a topic in my presentations at a number of conferences, in the hope any blogger in the audience would pick up the story, and live blog a link to some of the examples on my slides. Almost 5 years ago, I got the chance to present in front of the whole eBay executive staff on the SEO opportunity for eBay. At that point, I learned a valuable lesson on enterprise in-house SEO: Know your audience, or even better; know the favorite queries of the top executives in your company. When we walked out of that meeting, the first thing I did was making a phone call to the team, order a page to be created for Ernie Banks Baseball Cards, and start to include the page into our internal link optimization. Luckily our team had built a flexible platform for long tail keyword targeting, using top of the page relevant content, and an API call to include live items on the site to keep the inventory on the page fresh. With little to no help from the main engineering teams, the platform had been driving massive amounts of ROI for several years, where now the system could be useful to create the perception with the CEO of eBay, his SEO team could actually deliver. And guess what, within a day, the page was up. 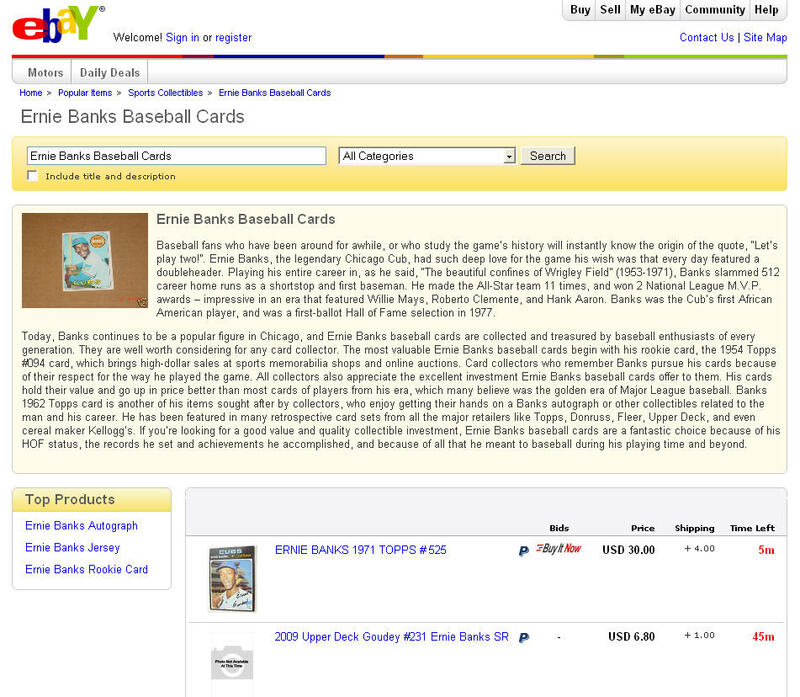 The following week, the page was ranking on the 1st page for the query Ernie Banks Baseball Cards. After 2-3 weeks, the page was #1. Awesome to be writing an email to your CEO and declare you conquered the topic he is so passionate about. After this, we pulled this trick many times more on executive favorite searches. For years, the page we created was ranking on 1st position, paying back the initial investment many times, like money in the bank! 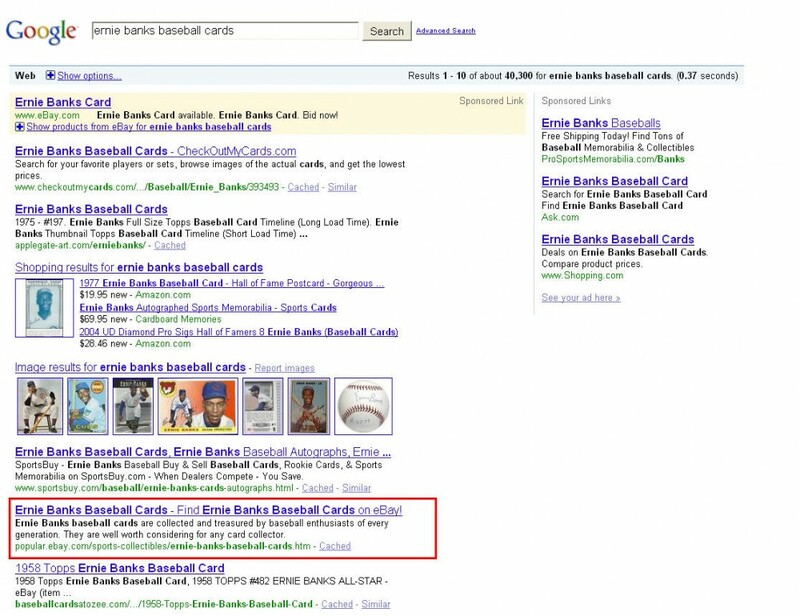 And even the normal search page started to rank, where for the query Ernie Banks Baseball Cards, eBay dominated the first 2 positions for years! Fast forward ~5 years, and I just ended up starting with Fanatics to work on it’s SEO. 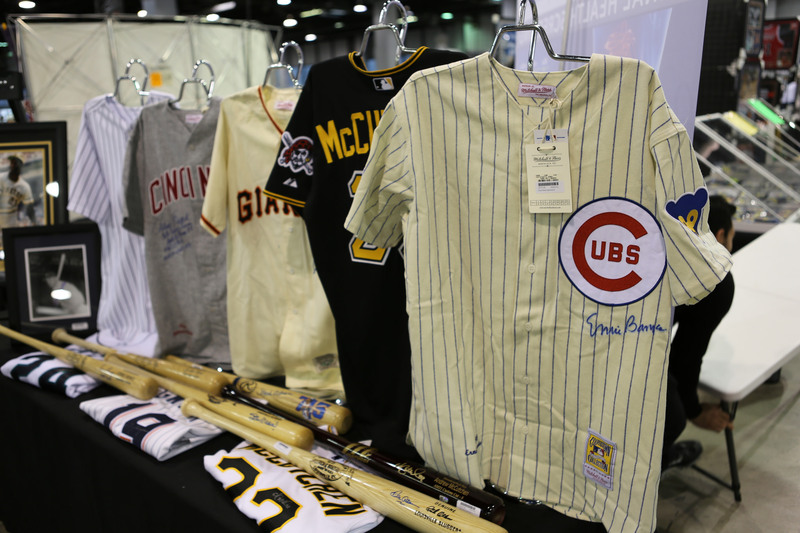 Fanatics powers many sites, among the league site for MLB. In the sports collectible arena, we have a good horse in the race with Fanatics Authentic. And YES, we do have Ernie Banks Baseball cards on the site for sale (and Ernie Banks Jerseys, Baseballs, Vintage Trading Cards), which brings me to the moral of this story; I’m currently competing with my own work from years ago. Many SEO’s out there are competing with other SEO’s. But have you ever thought about being your own competitor, and look at your strategy from a different angle? How would you try to beat yourself? What tactics would you deploy, and what amount of resources do you need? It’s an interesting question I would love to get more input on from you. If you would like to share some of your thoughts, feel free to add it in the form at the bottom of this post here, and I will make sure I mention you in follow up blogposts. As I’m battling my own SEO work, I’ve been helped by the large bureaucracy and in-efficiency of a large company like eBay. I normally wouldn’t diss a former employer which has been so good to me, but this is just plain stupid what has happened. Just 2 months ago, I noticed eBay had taken down the platform described earlier. The pages return a 404-error code, not even a 301 redirect. And where eBay used to have double rankings on top on profitable, long-tail keywords, driving a ton of free traffic, these have all been removed from the Google Index due to a block in Robots.txt and the platform been taken down. A former colleague called it the greatest ROI project ever! With an initial investment of $250,000, eBay consistently pulled in $20m in GMV per year. As the platform was running for more than 6 years, the payback on the investment must have been 75X the initial investment. How about that for ROI. Always know your audience, know what they might be searching for, and be prepared to rank a page to point out the quality of your work, pro-actively! When competing with large companies, do not under estimate the stupidity of their actions. You might get ahead, just because the executive team in that company things certain pages need to be taken down. Don’t forget, SEO is a zero sum game, when the #1 ranking page falls out of the index, some other page takes it’s place. Do you have what it takes to compete with yourself? If your the best in what you do, can you beat your own tactics, strategies and smarts? This opens up a whole new way of thinking how to set up your campaigns, because if you don’t compete with yourself, others might, and they might win! What would you do to compete with yourself, and win! 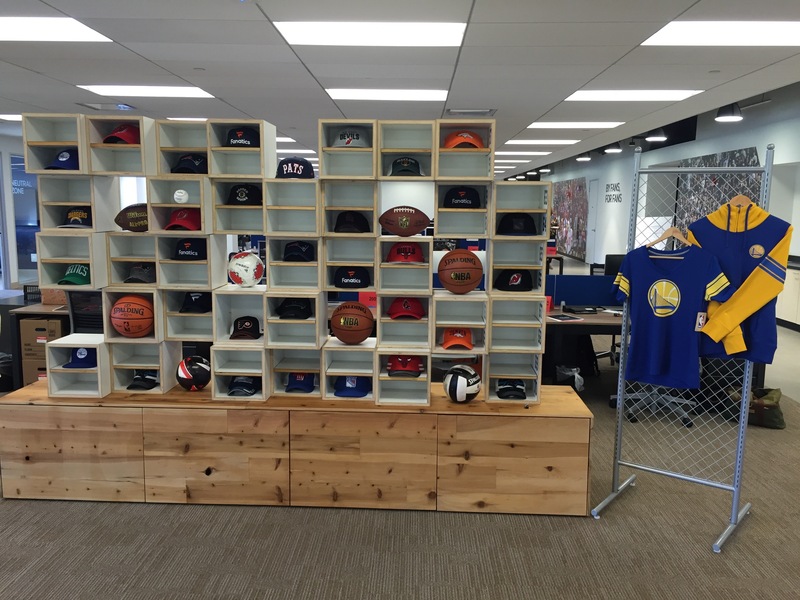 Leaving @Airbnb, Joining @Fanatics – Oh My! The year 2015 begins with a lot of change, something I’m quite familiar with since I’ve done major changes all at once in the past; i.e. in 2006 I met Fiona, moved to the US to take on a new job, got married and had a beautiful daughter. Yes, I like to shake things up sometimes! Moving to the US was one of the most difficult decisions I’ve ever made, but in the end it all worked out. Just recently, I was confronted with a similar hard decision I had to make; and it was more a luxurious position I was in that made me uncomfortable what to pick. I had to choose between staying at Airbnb, or take on a new dream job at a different company with a team I worked with in the past. 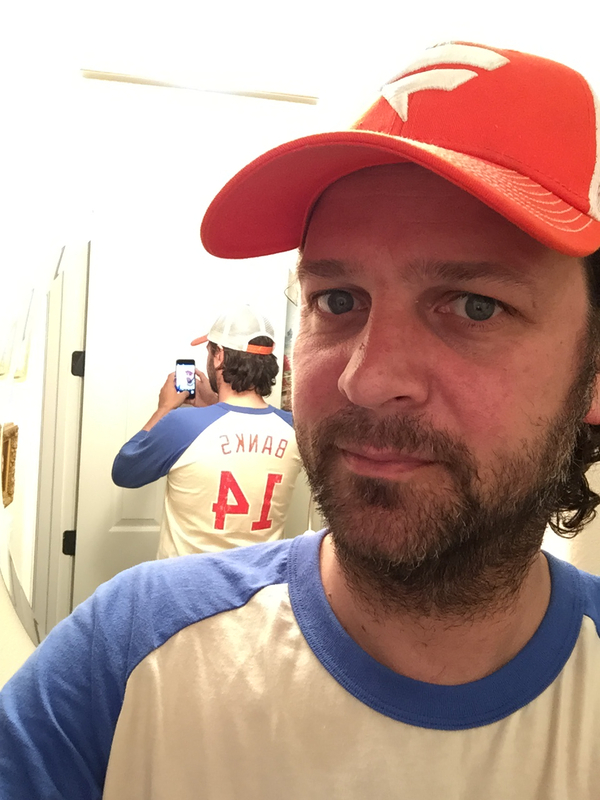 I picked the latter, and in December I joined Fanatics Inc. as the VP of Growth & SEO. 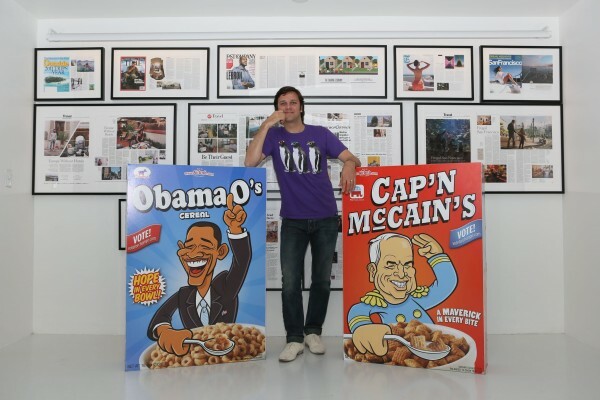 What made it extremely hard, is that I loved working at Airbnb, as you could tell from the many blogposts here, the Facebook posts of all my guests in between the Cereal boxes or all the tweets I’m still sending out when it comes to Airbnb. I mean, who doesn’t want to work with a company which enables Treehouse adventures for kids, story 1 & 2 here. At the moment, Airbnb is one of the hottest startups in the world, growing like a rocket ship, and is able to hire some of the most talented people in every discipline. So why leave..? And how do you come to such a decision? My former boss at Airbnb, Juney Ham, has a good piece on it was well. I have had similar reactions and feelings. I never thought I would leave the company so quickly, especially after the success I recently had with the Berlin Wall film – Wall and Chain, and a 2014 year that Rocked! Working with people like Jonathan & Willow made the decision even harder. What incredible smart and talented people! When I wrote the post I joined Airbnb a little over 2 years ago, I was thinking it would be at least 4-5 years I would hang out here, maybe even longer. So why leave? While working at the Wall and Chain film, I realized I have been standing still for a while. Last year I realized I’ve had been working on SEO for 10 years. That makes 11 this year. And while I love what I do, working on new marketing campaigns which extend beyond SEO, accelerated my thinking in new frameworks. At this moment in my career, I believe I will need to learn as any new things as much as possible! The combination of EPIC content, with data inspired stories and social media amplification, which were are combined in the Wall and Chain campaign, made me change and adapt some of the frameworks I’ve been using for years. On top of my LUMPS framework, I’ve built the Content-Brand Pyramid, which I will describe in a later blogpost. Back in August I received a Facebook message from my old boss at eBay, who had just recently joined Fanatics together with a bunch of other ex-eBay people. He made it perfectly clear from the start that he was in it to recruit me. Very transparent. The more I was digging into the company, Fanatics, the more I liked the opportunity. 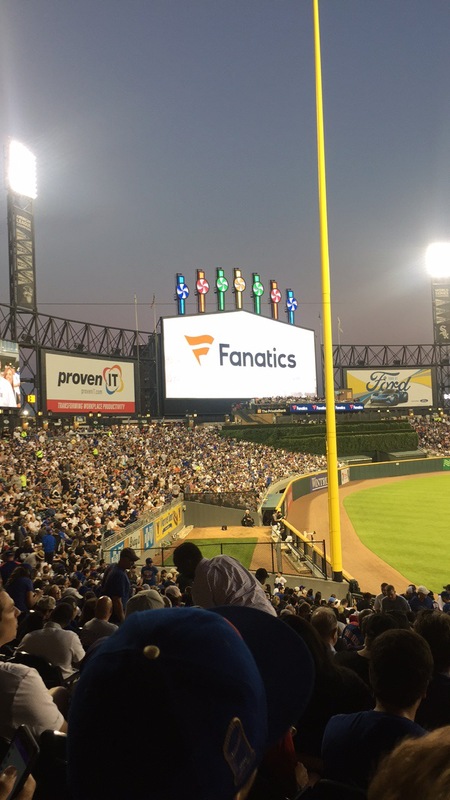 As part of the Billion Dollar Startup Club, Fanatics flies most of the time under the radar. When I was asked to put the ideal job description for my role together myself, I knew it was going to be a very difficult decision. At first I didn’t really wanted to leave Airbnb, but how many times in your career will you get the chance to determine what you will be doing, where you will be able to grow, and have a big impact on an already large and further growing company? I see the new SEO as the outcome of a very well designed product and EPIC content. This includes all the technical aspects of site structure, speed and technology, as well as the relevance of you content, mapping keywords and concepts to user intend, while building the authority of the sites through real smart brand marketing. Airbnb was able to match some of the requirements for what I wanted to do, but not all. 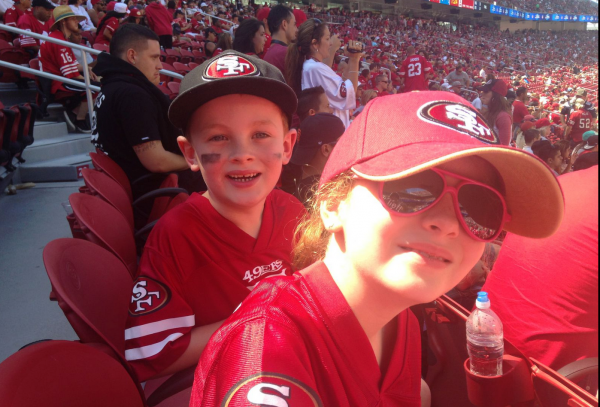 I took Miss J and Mr D to a pre-season game of the 49ers in the new Santa Clara stadium. As some of you might now, D is absolutely crazy about every sport, but especially NFL football. The whole day he is walking around with, and throwing a ball in the air. But don’t think J is not interested. She amazes me with her deep knowledge of player and coaches names, and how the game is played. This picture made me realize an important fact in my life; I want to connect on a deeper level with my kids. Don’t get me wrong, I believe in the mission of Airbnb, make everybody around the world they can feel they can belong anywhere. It’s an exciting higher objective to work on, and I know Airbnb will succeed! I’m rooting at the sidelines for the team, and as I have a vested interest in the success of Airbnb, I will do anything I can to help them further. Thanks to Brian, Joe & Nate for giving me the opportunity to work at such an amazing company, and thank you Jonathan for the new learnings I received working with you, although it was just for 6 months. This time I’m choosing to connect with my kids on a topic they are really passionate about; Sports. And with so many people around the world, sports runs deep in their blood. Real passion is hard to fake. Fanatics is currently one of only four $1B, profitable, private internet companies globally.